Reading activities for preschoolers generally focus on reading readiness and letter recognition. Educational experts widely agree that preschool-aged children are too young to begin formal reading instruction. This does not mean that preschool-aged children will not benefit from frequent and varied exposure to print and picture books. The importance of reading to children at a very young age has long been recognized by educators, parents and child-care providers. At the preschool level, this should be the heart of any reading preparation program. When reading aloud to preschool children, allow them to participate in the reading process. This is an important way to stimulate reading readiness. Try the following activities to get your child involved in the reading process. Preschoolers love to read books that include rhymes at the ends of each line. When reading these books to children, pause before the rhyming word and allow them to fill in the blank. Young children will learn to understand rhyming words and will begin to develop an understanding of context clues. Any time you see an opportunity for your preschooler to fill in a blank, ask them to do so. In Sandra Boynton's book, Moo, Baa, LaLaLa, a young child can fill in the blank after the words "A cow says...", or "A horse says..." Even a child as young as two will be able to fill in the blanks. Allowing young children to predict what will happen next in a story is an excellent way to develop their understanding of story elements. It also improves their listening comprehension and strengthens their use of context clues. Ask your child multiple times throughout a story what might happen next in order to promote discussion and more actively involve the child in the reading process. Prediction is a higher level thinking skill and not all preschool children will predict successfully. All predictions should be recognized as valid, and no one answer should be measured as correct. 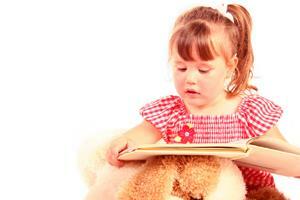 Once a preschool child has heard a book numerous times, he begins to memorize it. If you find yourself reading old favorites repeatedly, why not ask your child to 'read' the story to you. Don't expect him to get the words right or to even look at the words; just allow him to tell the story in his own words. The more he engages in this activity, the closer he may get to the actual print. Praise all attempts, and refrain from making any corrections. The goal here is to strengthen his understanding of story elements and use of context clues, to develop his memory, and to give him successful reading experiences. Believe it or not, nursery rhymes and songs are excellent reading activities for preschoolers. Sharing them with kids helps develop reading readiness. Reading nursery rhymes and singing songs with children will help them memorize simple verses. Then, when you read the verses to them from a book, put your finger under each familiar word as you read or sing to build sight reading skills and phonemic awareness. Any time you read slowly to a preschool-aged child, point to each word as you say it aloud. If you are enjoying a book before bed, just snuggle up and enjoy the story. Regular experiences with a rich variety of books allow preschoolers to gain an understanding of how print works. Young children need to recognize that letters, when put together, make sounds that are words. This is called phonemic awareness. Teach your preschooler that books open a certain way, pages turn a certain way and that print moves in a left to right progression. Once a young child has mastered these skills, he or she may be able to do more than just memorize the ABC song; namely, she might start doing letter recognition as well. Some reading activities for preschoolers focus on letter recognition. Concept books focus on teaching children a specific idea, such as the alphabet and numbers, and are an excellent way to build both letter and sound recognition in preschool children. Parents can build letter and sound recognition while engaging in everyday activities. While driving in the car, ask your preschooler to look for things that begin with the letter 'B.' At the grocery store, go on a scavenger hunt to find labels with the letter 'T' in them. Every preschool child should have a set of letters, either of the plastic magnet kind or alphabet blocks, to hold and manipulate. Regularly engage your child in play using these letters. Once a child has developed some degree of phonemic awareness, yet long before he learns to decode words, he will begin to recognize familiar print. Familiar print is any word that appears consistently in a child's environment, like Cheerios and STOP signs. The more exposure preschool children have to familiar print, the better prepared they will be for reading instruction. When a child recognizes a word in her environment, acknowledge that as an achievement. Write the word on an index card and hang it on the refrigerator, or spell it out with magnet letters to reinforce the skill. Build a word bank from which she can read on a regular basis. This builds confidence as well as reinforces letter and sound recognition. Use the word bank to practice recognizing letters and sounds. Preschool children do not need to be engaged in a formal reading program, instead, expose them to print as often as possible to develop reading readiness skills. Reading to children, exposing them to many different types of books, exposing them to familiar print and actively engaging them in the reading experience will all help to prepare them for formal reading when they are older.